Welcome to the fourth edition of the SPIRAL newsletter. The SPIRAL project is now entering its last year, and we want to take this opportunity to update you on what we’ve been up to this year, and what our plans are to help make 2013 a great year for Science-Policy Interfaces. This year has seen the completion of our work on why and when more effective science-policy interfaces are needed, including the identification of some attributes to support the development of SPIs. We have organised a number of workshops, including an AfriBES workshop, another on science-policy communication, and a workshop on better interfacing EU research projects and EU policy-making. We have also started to communicate our work, developing briefs that are aimed at researchers, decision-makers, funders, and other key knowledge holders and users. We have plenty of plans for 2013, including continued involvement with our test cases, and also through our networks and our participation at workshops and conferences. The New Year will start with a bang, with the first plenary meeting of the Intergovernmental Science-Policy Platform on Biodiversity and Ecosystem Services (IPBES), in Bonn (Germany) from the 21st to the 26th January 2013. The meeting will “aim to agree on the remaining rules of procedures for the meetings of the platform, consider other rules of procedure for the platform, elect Bureau and Multidisciplinary Expert Panel members, and agree on the next steps by which the IPBES work programme can become operational as soon as possible”. So plenty to discuss… SPIRAL will be represented at the meeting: we will be giving a talk in a side event on “Regional support approaches to IPBES – Europe as showcase” on Friday 25th January. We will keep you updated on the meeting and on discussions at the side-event. 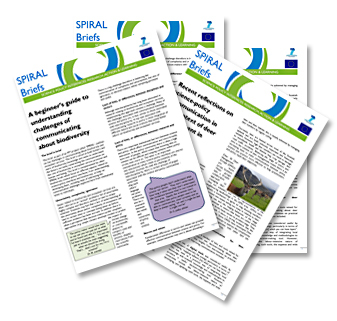 In this issue you will find a wrap-up of SPIRAL key messages so far, and more details on forthcoming SPIRAL plans and activities. And as usual, we also invite you to meet some members of the team: Median and the University of Bucharest. This is an important year for SPIRAL, and building on what we have learned so far, we need your support in telling us how we can make our work this year as relevant as possible, and communicate our results in the most appropriate way. So please read on, and let us know what you think of our plans. If you’re interested in the interface between science and policy, why not join our Dynamic Network of Advisers! Just get in touch with us at info@spiral-project.eu as we’ll take it from there. "How to make our communication on biodiversity take off...."
SPIRAL WP2 organised a workshop on June 8th, 2012, in Edinburgh, to present the results of work on factors constraining and facilitating communication on the role of biodiversity in underpinning livelihoods and ecosystem services. Participants representing a wide scope of expertise and perspectives helped us refine our recommendations. They also helped us divide recommendations by sectors (science, policy, both) and scales (individuals, teams and organisations). All our recommendations are expanded on in briefs, available from the website. Our general recommendations are on the SPIRAL website. Are they helpful to you? Let Kerry Waylen and Juliette Young know your views. "Better interfacing EU research projects and policy-making..."
On the 20-21st September 2012, a workshop on “Better interfacing EU research projects and EU policy-making” was organised by SPIRAL jointly with the European Commission Directorate General for Research and Innovation (DG RTD), with the participation of the European Environmental Agency (EEA). The workshop brought together coordinators and other representatives of EU-funded biodiversity research projects and science-policy experts, including representatives from the European Commission Directorate General for Environment (DG ENV). Participants built on their experience of over 50 biodiversity-related projects funded under the current and past Framework Programmes for Research. We have now developed recommendations from the workshop’s discussions and related work carried out in SPIRAL. They address strategic as well as operational aspects of science-policy interfaces. They also critically explore the potential contributions of the Biodiversity Information System for Europe (BISE) and Eye on Earth (EoE) to science-policy interaction processes. Read the recommendations on the SPIRAL website. For more information, contact Carsten Neßhöver or Johannes Timaeus. Visitors can plug in who they are, and what they need to know about SPIs or biodiversity, and a menu-type schematic allows them to gain personalised information to address their specific needs. Briefs will cover a range of topics, including understanding biodiversity, understanding SPIs, developing SPIs and assessing or evaluating SPIs. They are developed for a wide range of audiences including scientists (within and outside the biodiversity and ecosystem services area), decision-makers at all levels, funders, evaluators, translators and other key knowledge holders and users. Consult the most recent list of available briefs. If you would like us to write a brief on a particular aspect that isn’t currently included in our “brief map”, please let us know and we’ll see what we can do. We have been lucky to present our SPIRAL approach and results in a number of different meetings, conferences and workshops. Some of these included a seminar to members of the Scottish Government, a talk at the European Congress on Conservation Biology (ECCB) in Glasgow, another at the 1st BiodiversityKnowledge conference in Brussels. We have also given talks at Summer schools (the ENGO summer school in Budapest, the ALTER-Net summer school in Peyresq). We will also be presenting our work on the UK NEA at the British Ecology Society (BES) annual meeting in Birmingham in December. In this Newsletter, we' d like to introduce to you two more project partners: Median and the University of Bucharest. The Department of Systems Ecology and Sustainability (DSES) has been established in 1997 at the University of Bucharest by integration and development the former training and research units in the field of biological and ecosystem ecology, and environmental protection. Currently DSES consists in: i) Graduation School for integrated and adaptive management of the biophysical components of “natural capital”/”biodiversity”; and ii) Doctoral School and Research Center (DRC-DSES/UB) focused on inter and transdisciplinary training and research programmes regarding the complex interactions within and among socio-ecological systems, nested across space and time scales. DRC-DSES/UB promotes, improves and implements, through its training and research activities the theoretical background and operational concepts and tools provided by the transdisciplinary science of Systems Ecology and Sustainability. In that regard DRC-DSES/UB relies on: i) 75 staff members and distributed research facilities (Bucharest, Braila, Sinaia); ii) networks established with disciplinary or interdisciplinary research teams and organizations from our university or other universities and research institutes and; iii) cooperation with a wide range of stakeholders categories, including decision and policy makers, in different science- policy interfaces. DRC-DSES/UB alone or in partnership, carries out basic, applied and strategic research in the nested socio-ecological systems of the Lower Danube River Catchment. DRC – DSES/UB plays a catalytic and coordination role in the process of networking and development the national platform for transdisciplinary research of local and regional Socio-ecological systems and also contributes for large scale and long term research (e.g. EU-ALTER-Net 2, ILTER; >15 EU-FP projects). MEDIAN is a small company positioned at the intersection between scientific research and practical concerns of institutional, societal, and economic actors. It is based in Barcelona (Spain) and provides research, teaching and consulting services on environmental governance and business ethics. Expertise includes: science-policy interfaces; decision-making and policy formation under conditions of complexity; integration of natural and social sciences; environmental research strategies; participatory approaches; environmental strategies of corporations; decision-sciences; and business ethics. Median's partners involved in SPIRAL include the director, Sybille van den Hove, who jointly coordinates the project with Allan Watt and Juliette Young from CEH, and two senior researchers: Rob Tinch and Estelle Balian. Aside from working more on our briefs, and presenting results at conferences and other fora, we will be focussing on our test cases, including organising an AfriBES workshop in the Spring. We’re also working towards a handbook on good practices to develop new SPIs and improve the effectiveness of existing science-policy interfaces. We will also be publishing our results in peer-reviewed journals. We are already looking forward to updating you again via newsletter in the summer. In the meantime, please check the website or email us anytime. If you are interested in our results, or if you have ideas on how best to help disseminate our results, get in touch with us. The easiest is by email. 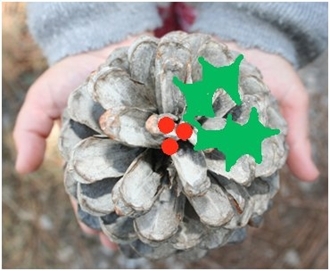 Finally, on behalf of the whole SPIRAL team, we wish you all a marvellous Christmas and New Year.